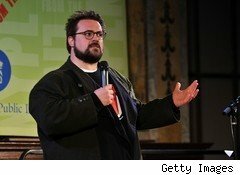 In February, film director Kevin Smith made headlines when he was kicked off a Southwest Airlines (LUV) flight because he was allegedly too large to fit comfortably in his seat. Furious at his treatment, Smith responded by quickly telling the story on his blog, his podcast, Twitter and other social media outlets. For travelers concerned about narrowing seats and prejudice against overweight passengers, the incident became a catalyst for activism. For airlines, it became a cautionary tale. On Monday morning, the second act of the story took place at New York's JFK airport, where Smith, his wife and friend Jason Mewes were denied access to a Virgin America flight despite arriving at the gate 10 minutes before scheduled departure. As Smith wrote on his blog: "We pleaded with Manny (the unfriendly face of Virgin America JFK working the gate), pointing out the remaining time (there were still 8 minutes before scheduled departure), and pointing out that the jetway was still attached to the plane. Flying as much as I do (usually up at the front of the plane), I know that the jetway only gets pulled back ONCE THE PLANE DOOR IS SECURELY CLOSED." Even though the jetway was still attached, Virgin refused to let the trio on their plane. According to Smith, Manny was soon joined by Erwin, his superior, who also refused to grant the group access to the plane. Later, the director pointed out that his wife had packed her medication in her luggage and would need it within eight hours, but claims that the two Virgin attendants refused to take the bags off or otherwise help the travelers: "Erwin said that wasn't possible. So did Manny. They didn't even TRY to call someone about getting the bags off. 'They can't do that,' was all I got. Dorothy, the concierge, said in her 27 years working with all the airlines, she'd never seen anything like it." Anybody who has traveled in the last decade could probably point out Smith's mistake: Instead of setting up camp at the gate for a half hour before arrival, the director chose to stay in a VIP lounge until the last minute. Then again, he hired a concierge, Dorothy, to ensure that he would get to the gate in time, and conducted his luggage check-in and ticketing long before his flight in order to save time at the gate. Perhaps the harshest hit was the fact that this was Virgin, an airline renowned for its service. In an embarrassing bit of irony, founder Sir Richard Branson touted the company's personal touch on Morning Joe last week, noting that Virgin is focused on producing a best-in-class customer experience. In fact, Smith himself acknowledged the quality of the airline, stating: "You guys are actually a top-notch operation, about whom I literally said to my wife a mere five days ago while we were en route to the east coast 'Virgin does it right, man. Such a great airline.'" But Virgin isn't immune to trends in the airline industry. Even though its customer service is widely regarded as one of the best around, the airline business that has become notorious for mistreatment of passengers. With invasive scans and pat-downs (OK, not exactly the airlines' fault) joining charges for meals, the end of free blankets, extra charges for luggage and a host of other indignities, flying has become an unpleasant, combative experience for most people on both sides of the ticketing counter. In this regard, Virgin faces an institutional attitude that won't be defeated with free Wi-Fi and excellent in-flight food and entertainment. Writing directly to Virgin, Smith puts it succinctly: "I don't fault you for the petty, lazy, unhelpful behavior of your JFK terminal 4/gate B25 desk crew. But...it all starts at that check-in desk; and what started there today was the end of our business relationship."